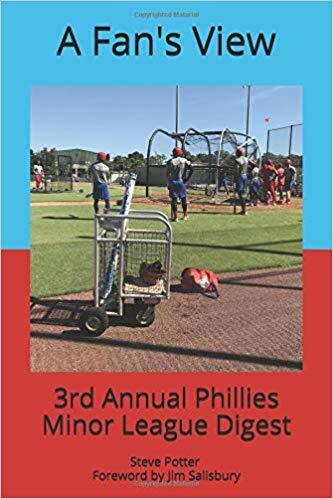 A Fan’s View: Third Annual Phillies Minor League Digest is out in paperback on Amazon. My friend, Steve Potter, is the author. Philadelphia sports writer Jim Salisbury provides the foreword. Steve has enlisted contributions from people who have seen the Phillies’ affiliates and prospects in the minors. I was one of several contributors. Phuture Phillies is not a place for people to sell things and I have deleted such posts in the comments section. However, I don’t get paid for my time at Phuture Phillies, so I’m going to allow myself this one exception. Especially since NO ONE ASSOCIATED WITH THIS BOOK RECEIVES ANY TYPE OF MONETARY COMPENASATION. This is Steve’s third digest He donates the proceeds to Phillies’ Charities. Here’s the LINK, if interested. Nick Rickles, 28, Acquired from Washington in 2017; .245/.271/.394 in 199PA; 7HR 26RBI; 4%BB/22%K; .267 vs RHP; .217 vs LHP; 48 games caught with 1 error and 1 passed ball; 5/23 CS (22%); Rickles did a good job receiving and was adequate with the bat but mediocre throwing runners out. Grade: C+; 2019: May be back for depth, but likely elsewhere. Enyel De Los Santos, 22, Acquired from San Diego in 2017; 22 starts; 10-5 with a 2.63ERA: 127IP; 1.16WHIP; 3.1BB/7.8K per 9;.249 vs RHH, .216 vs LHH; 1-1 with a 3.00ERA in 5 starts since August 1; De Los Santos put himself on the map this season with an excellent 2018 where he was consistently very good. Grade: A-; 2019: Likely will bounce back and forth between Lehigh Valley and Philly challenging for a rotation spot.